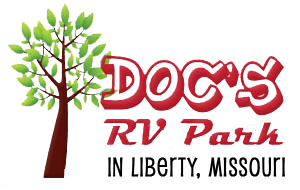 WELCOME TO DOC'S RV PARK! We're a quiet, secluded, tree-filled RV Park, catering primarily to monthly rentals. Conveniently located in Liberty, Missouri, serving the greater Kansas City metropolitan area for over 60 years. No tent camping, and no shower/restroom facilities available.